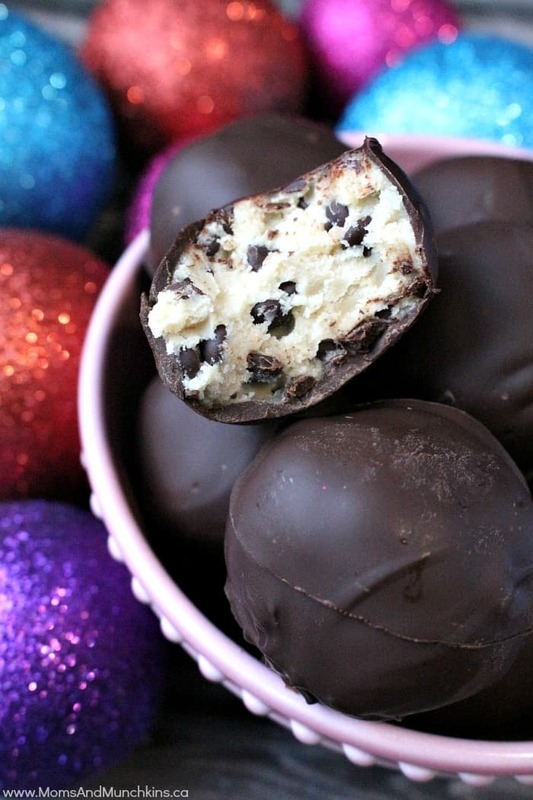 These Cookie Dough Truffles are really easy to make. The “dough” in the truffles isn’t really raw cookie dough and there are no products in it like raw eggs that make them an unsafe food choice. I have to warn you though, you won’t be able to stop at just one! Seriously, have a few extra napkins on hand because you will drool. Also, if you eat these at work be prepared with some extras on hand because you will be requested for samples! These cookie dough truffles freeze really well so you can make a large batch and freeze some for unexpected guests. In a large bowl, cream butter & brown sugar with an electric mixer at medium speed until the mixture is creamy. Add vanilla and beat until mixed. Gradually beat in flour and milk. Place balls on waxed paper and chill in the fridge for 2 hours. Using a spoon, swirl balls in the chocolate mixture until evenly coated. Gently lift each one out of the chocolate using 2 forks. Place them back on the wax paper and chill in the fridge for at least one hour before serving. To stay updated when we post more delicious recipes like this one, follow us on Facebook, Twitter, Pinterest and Instagram. These look so yummy! I’m going to try making them this weekend 🙂 thank you for the great recipe! these really are the bomb. i have made them as well. These look amazing, I think they would be great to make for my sons v-day party with a little pink hearted sprinles. I love cookie dough, but the raw eggs always make me nervous. This looks like a super delicious way to enjoy it without any risk! I heard about these a few months ago and wanted to make them but the recipe looked really complicated. This recipe looks like something I can handle though – thank you so much for posting it, I’m definitely going to make them! Oh my goodness – these look FABULOUS. I’m saving this recipe to make for my husband.